Windows 7 by default runs all the processes running on the system with same priority, which means that all processes are equally important when it comes to the allocation of resources by the system. We sometimes we use applications that require more resources, so it may be prioritize special needs depending on our needs. 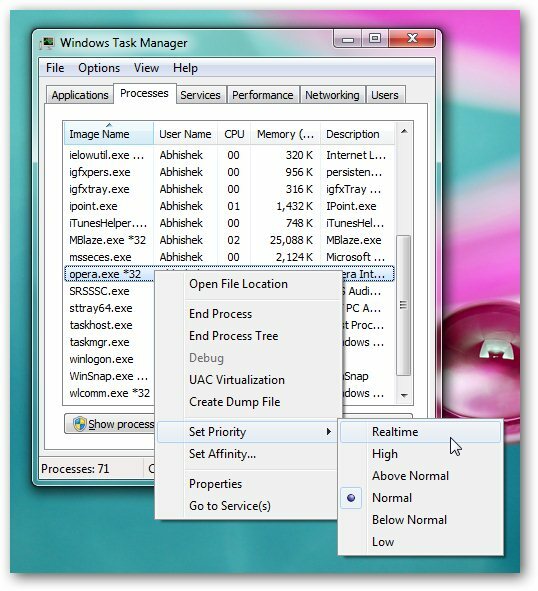 Launch the Task Manager by pressing CTRL + SHIFT + ESC from Keyboard. Select the option you want to set priority to. You will get a security prompt. Accept it. Windows will show you a notification that the priority has been changed. This Article Has Been Shared 1248 Times! This tutorial will show you how to use your ordinary web camera as advanced motion detection device to watch remotely via internet connection, what is going on in your house or office. In this tutorial, we will show how to add 3D flip option in right click context menu in Windows 7. Cite this article as: Abhishek Ghosh, "Change the priority of processes in Windows 7," in The Customize Windows, May 17, 2011, April 21, 2019, https://thecustomizewindows.com/2011/05/change-the-priority-of-processes-in-windows-7/.